Cleaning the sinks in your Waldorf, MD home after shaving, washing your hands, trimming your hair, brushing your teeth or rinsing off paintbrushes will only go so far when it comes to preventing debris from flowing down the drains. Proper drainage of your sinks, tubs, and showers only happens when you make a conscious effort to prevent debris from entering them. You can make all the effort in the world and still something that doesn’t belong down the drain can wind up down there, especially if you have children. The experienced team at A Better Plumber has more than two decades of experience providing drain cleaning in Waldorf, MD. We pride ourselves on providing you with excellent service when it comes to clogged drains, backed up toilets, broken pipes and various other plumbing problems. We respect your valuable time, which is why we arrive in the window provided when the appointment is scheduled. For the most part, a homeowner won’t notice a clogged drain until it is too late. It takes time for a drain to become clogged, which is why most don’t notice it until the water backs up into the sink while washing your hands or brushing your teeth. Clogged drains can easily cause your sink to overflow, so make sure you don’t let the issue get to that point. The leading cause of clogged drains, especially in bathrooms is that of hair. Does your husband shave using the bathroom sink? Do you comb your hair or dry it standing in front of the sink? If you answered yes to either or both of these questions then there is definitely hair causing a clog in the bathroom sink drain. The best thing you can do is install a drain stopper in the sink. This will catch as much hair as possible. Just be sure to empty it after each time you shave or each time you brush your hair over the sink. Do you use bar soap to wash your hands? Stop immediately and start using soap from a dispenser or pump. The same goes for bar soap use in the shower. Bar soap is made of fat or grease, which is a major contributor to the clogging of drains. Regardless of what has caused the clogs in your homes plumbing system, give our team of Waldorf drain cleaning plumbers a call today to get your drains flowing like they used to. Do you have a garbage disposal in your kitchen? If so, you might wind up with a clogged drain because the appliance might not be working properly. If there is no disposal in the sink and you still have a clogged drain in the kitchen sink you might have food stuck in the pipe. 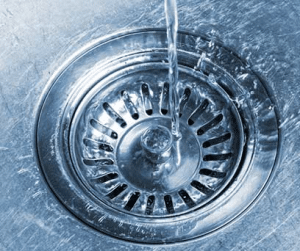 No food should be sent down the kitchen sink drain if there is no garbage disposal. You will need to remove the curved P-trap part of the pipe under the sink to clean out the clog. It’s also possible that the clog in any of the drains in your home is being caused by tree roots. Tree roots can grow right through a pipe leading to your home. The root can block the pipe entirely, ultimately backing up the drain into your sink and even all over your kitchen or bathroom floors. If there is a tree root growing into a pipe you will need a licensed plumber to handle the removal of the root and the replacement of the pipe affected. It’s also possible that tiny objects have been tossed down the drain, leading to a clog. Tiny objects that can clog a drain include wipes, toys, paper products, jewelry, tampons, napkins and more. Never flush any of the items listed in this section. The only things that should go down a drain or be flushed down a toilet are water, bodily waste, toilet paper and other thin liquids. You will no longer be able to wash your hands, clean the dishes, shave, or do anything else involving the sink when you have a clogged drain in the house. Depending on the layout of the home’s pipes you might also see issues with your toilet and the drain in your shower or tub if the sink is clogged. A toilet that has backed up can cause your home to smell awful. A backed up toilet can push human waste all over the floor of your home and lead to illness if not cleaned up effectively. A plumber with a license can inspect the toilet, the pipes related to the toilet, and then diagnose the issue at hand. The next step would be for the experienced plumber to remove the item clogging the drain so you can begin flushing the toilet safely. Put a lid lock on the toilet seat if there are children in your home so they cannot flush toys, excessive amounts of toilet paper, or any other item that can clog the toilet. Having a clogged shower or tub in the home will make matters much worse than if you have a clogged sink drain. This type of clog will make it impossible to bathe, which becomes even more daunting when there are children in your home. If you don’t know of the clog yet, you will definitely find it when the water backs up and overflows onto the floor of the bathroom. The most common cause of clogs in showers and tubs is that of hair being stuck in the drain. Simply remove the cap to the drain and pull out any and all hair you see. If removing the wad of hair you find does not allow the water to flow freely then it’s time to call a plumber to check the pipe for more serious issues. Our experienced and reliable team of Waldorf Plumbing technicians has been helping homeowners for more than two decades fix drain clogs and other serious plumbing issues. We can be dispatched to your home in a matter of minutes, inspect the affected area, diagnose the problem and then make the necessary repairs so you can get back to a clog-free life. Give us a call today at (301) 278-8786 to schedule your clogged drain cleaning in Waldorf. We are standing by ready to serve you!